Agricultural produce ‘on the move’ in the port of Dar Es Salaam, Tanzania. 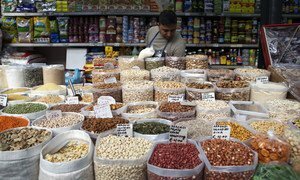 A United Nations commission overseeing plant health has adopted a new global standard to ensure that international trade in plants and seeds – vital to feed the world's population – is free from agricultural pests and disease-causing bugs. According to the UN Food and Agriculture Organization (FAO), the threat of transmission of pests – unwanted stowaways – on ships and containers transporting agricultural cargo, especially seeds, is a growing concern around the world. “Unlike other agricultural products that are destined for consumption, such as wheat, barley or lentils, seeds are a cause for greater concern,” said the UN agency in a news release. “[As they are] destined for planting, there is a greater risk that any pests they carry could establish themselves and spread after planting,” it added. For instance, once ashore, pests such as the gypsy moths, giant African snails or Argentine ants can invade new environments, devastate crops and cause much hardship. Adopted last week by the Commission on Phytosanitary Measures, the governing body of the International Plant Protection Convention (IPPC), the new standard will help harmonize the ways countries deal with the complexities of the international seed trade. The efforts are also expected to facilitate trade in seeds – valued at about $12 billion annually – while ensuring that such shipments safeguard food supplies for a growing global population. In the news release, FAO further underscored that such steps are important to protect global food security as well as for the achievement of Sustainable Development Goals (SDGs), particularly those related to combatting hunger. “Because the IPPC is the only organization to set government-recognized plant health standards that facilitate international trade, the decisions made here will be essential to further protecting the world's plant resources, the very foundation of life,” said Kundhavi Kadiresan, FAO Assistant Director-General and Regional Representative for Asia and the Pacific. “FAO's vision of a world without hunger can only be accomplished with healthy plants that are free from regulated pests,” she underscored. The twelfth session of the Commission on Phytosanitary Measures, which concluded last week in Incheon, Republic of Korea, also discussed guidelines for an import regulatory system, and a series of treatments that stop pests from burrowing into wooden packaging materials and methods to stop fruit flies from attacking citrus fruits. Although the International Year of Pulses has helped raise awareness globally of the many benefits of pulses, such as beans, lentils and chickpeas, gains must be further strengthened to achieve the international community's new development goals, the United Nations Food and Agriculture Organization (FAO) said today.